Former President George H.W. Bush’s death on Friday led to a torrent of reactions. There came loving tributes from the liberal center-left (President Obama called him a “patriot and humble servant”), scathing, sometimes gloating humor from the left bringing up Bush’s legacy of war crimes and imperialism, and a mixture of vitriolic tirades from conservatives and ultra-conservatives, equal parts enraged with Bush for having distanced himself from Trump and Trumpism and the left for disrespecting a President. This confused me, honestly. Why was it now, when Bush had just died, that we all decided to voice our opinions about the man’s politics? Don’t get me wrong — this isn’t some “both sides” argument that we should save our takes for after some arbitrary grace period has passed in the wake of a death like this. But it seemed interesting that we all suddenly decided to yell about the political and military events of decades ago, just because the man who was the face of those decisions had bought the farm. Bush was President, most recently, just under 26 years ago before Bill Clinton was sworn in January of 1993. That’s a quarter of a century ago. 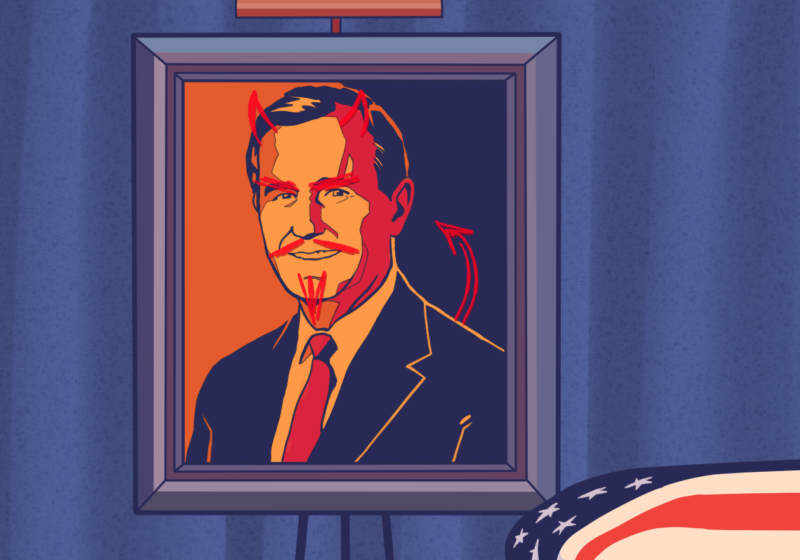 Nominally, he was a one-term President, a Republican, who succeeded Ronald Reagan and more or less continued the interventionist, neo-conservative legacy of his predecessor. His popularity soared after he defeated Saddam Hussein in the Gulf War, driving the dictator back into Iraq with no shortage of war crimes from both sides of the armed conflict (on the so-called “Highway of Death,” American forces attacked thousands of unarmed, fleeing Iraqi soldiers who were in compliance with orders from the U.N. and, allegedly, also attacked Kuwaiti and Iraqi civilians indiscriminately). But his approval collapsed in a failing economy following the fall of the Soviet Union, and he was forced to break his most famous campaign promise: “Read my lips. No new taxes.” He was voted out of office after his first term, replaced by the charismatic but ultimately not particularly different Clinton, and faded from the limelight until his son was elected in 2000. We know how that went. But why is Bush’s death the occasion to remember all this? He was a powerful person, yet power is really the ability of people to act together. Even if people listened to what Bush himself had to say, the events of his leadership were bigger than he was. The actions of his administration didn’t die, rather, they will have consequences for many years to come. George P. Bush, H.W.’s grandson, said after his death on Twitter that “to me, he will always be Gampy. The man who taught me to fish in Maine, to throw a horseshoe and to swing a baseball bat lefty.” This was the Bush who died on Friday. I’m not calling H. W. a good person, either — well-substantiated claims of sexual harassment say otherwise — but I am saying that we’re often too ready to conflate a person with something much bigger than any person — history. Let the discourse flow while these people are still alive and long after they die. Instead of using the deaths of people as reminders of politics that still influence us today, we should all strive to inform and be informed about the very relevant effects of history on our lives. Let the people who knew them take their deaths how they will — grief, relief, or otherwise — but don’t wait for the mouthpiece to die before trying to understand the politics and power they expressed.